Founded by Richard Kirkendall in 2000, NameCheap was established to give the average people with the opportunity to create and launch their own websites without needing having advanced programming and coding skills and deep pockets. Serving more than a million clients and hosting over three million domains, NameCheap has become one of the leading web hosting solutions providers in the market today. As one could conclude by its name, Namecheap is a leading provider of affordable domains and hosting services, and the preferred choice of many website owners and startups worldwide. It is ideal for individuals launching their first website, as it lets them choose a domain name, craft their pages without coding skills, and manages entirely the functionality of their WordPress site. Yet, that’s not all there is to Namecheap – the service is also offered to businesses and resellers, which get to choose a catchy name for their brand. Next to flexible and reliable hosting, they will also get a set of professional email services and SSL certificates; and optimize their websites and stores with professional tools such as Weebly, Google Apps, analytics, SEO help, traffic boosters. Regardless of the plan you’ve chosen, you will enjoy the support of a knowledgeable team of support agents any time, via phone, email, and live chat. NameCheap promises an uptime of 99.9% per calendar month. To ensure the delivery of its guarantee, Namecheap employs the latest hardware and software firewalls, as well as the recent server models from HP, Dell, and Supermicro. All servers have at least two processors, 16 GB of RAM and four hard drives with RAID protection. Every company is different, and can require a specific solution that will be designed for their business size, type of clients and employees and even individual niche they deal with. It's not wise to count on getting an ideal service that will be suitable for each company regardless of their history is. It may be a good idea to read a few Namecheap reviews first and even then you should remember what the hosting service is intended to do for your company and your workers. Do you need a simple and straightforward hosting with just elementary features? Will you really make use of the advanced tools needed by experts and big enterprises? Are there any particular tools that are especially beneficial for the industry you operate in? If you ask yourself these questions it will be much easier to find a solid service that will fit your budget. We realize that when you make a decision to buy Hosting Services it’s important not only to see how experts evaluate it in their reviews, but also to find out if the real people and companies that buy it are actually satisfied with the product. That’s why we’ve created our behavior-based Customer Satisfaction Algorithm™ that gathers customer reviews, comments and Namecheap reviews across a wide range of social media sites. The data is then presented in an easy to digest form showing how many people had positive and negative experience with Namecheap. With that information at hand you should be equipped to make an informed buying decision that you won’t regret. Namecheap offers various support channels for its customers. Options include live chat and tickets. For those who are looking for self-help alternatives, Namecheap also provides a knowledgebase as well video tutorials. Customers can also interact with other customers for answers and information via the community forums. What are Namecheap pricing details? Namecheap offers a 99.9% uptime guarantee and provide service credits for any downtime users experience. Namecheap provides a site builder plan called Onepager, which is loaded with tools and features that allow for fast and easy creation of websites from the ground up. However, it is only available if you pay a monthly fee. Namecheap has a specific plan for eCommerce websites call the Business SSD. This package is loaded with features designed for business and supports a variety of shopping carts. 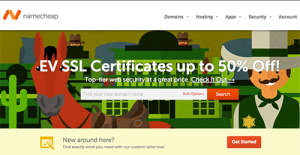 Namecheap also offers a number of SSL certificates for added blanket of security. Although known primarily as a domain registrar, Namecheap does offer Linux hosting solutions. Not all but a number of Namecheap plans come with unlimited bandwidth and email addresses. Namecheap offers a number of easy install scripts including WordPress. Namecheap does not offer a free domain with its hosting plans. Namecheap accepts payment via major credit cards, PayPal. Google Wallet, Dwolla, and BitCoin. Namecheap uses only the latest hardware and software from the leading brands to ensure the integrity and security of its networks. Physically, all datacenters are equipped with fully redundant key systems, including network, power, climate control and security. The infrastructure of Namecheap's datacenters are served by multiple fully redundant VMware-based private clouds incorporating HP SAN storage. My Shared hosting was suspended last year in July. I was receiving too much traffic according to support. I was in direct contact with support during this time. They recommended I upgrade to a dedicated server. I had stated that this surge in traffic was due to 1 page and it was temporary. They never told me I had to upgrade or gave me any warning that I would be suspended. I woke up around 5 am on the 4th of July with 2 emails stating my account had been suspended. Needless to say, I was quite furious. Support told me I had to upgrade otherwise they wouldn’t restore my service. Granted, this was gonna be the biggest day concerning my Adsense website. Long story short. My site didn’t become active until July 5th after upgrading to a dedicated server, which I had no idea how to operate. Support said I’d get the hang of it. Today is February 17th, 2018 and the site that I worked very hard on, went from 75,000 users a month website and growing rapidly to a website that lost ALL its rankings. I have never regained the traffic I once had. I find out later on that when transferring to another hosting or upgrading to a dedicated server, I needed to run 301 redirects. Support never specified and I had no clue. I still have a bad taste in my mouth about this. I was on the verge of making $500 a day on Adsense to zilch. I’m in the process of transferring every domain I own to Hostinger. I never had any previous disputes prior to this. It seems Hostinger so far has been a great hosting provider. I would prefer Namecheap because I really do like the platform, but I can’t seem to get past the negligence on their part.